Bike It Now! is very much a hands-on owner/operator business, covering all things bike related – sales, servicing, tours and hire. The doors of its Clyde shop are open seven days a week, all year round. Duncan was the first to move to Clyde. He arrived in mid-2012 to work as bike hire manager for Bike It Now’s original owner. Lisa and Fletch moved for Lisa’s work (at Contact Energy) in late 2012 and, at that point, Fletch started driving for Bike It Now! When the owner approached Duncan about buying the business, the trio realised it was an opportunity they could make work. The three of us get on very well and enjoy what we do. We all have different strengths. Duncan is one of those people that could sell ice to the Eskimos. He managed R&R Sport in Dunedin for 10 years and has a complete passion for cycling and people. Lisa worked in IT support for a large accountancy firm, so she’s in charge of our IT, accounting and payroll. Fletch was a high school head of department for physical and outdoor education. Logistics and making things happen – they’re Fletch’s strengths. Central Otago attracts different people for different reasons – whether they be locals, or visitors. The Bike It Now! team was itself established, based on the owners realising the value of their different strengths and skill sets. They extend the same philosophy to their customers and operate around the mantra: “It’s all about you, the customer”. People want that personal touch, to feel as though they are valued. The four-year-old trying out a balance bikes gets the same treatment as someone wanting a high-end bike. Someone who wants to do a half-day hire gets the same bike fit-out as someone going on a five-day luxury tour. 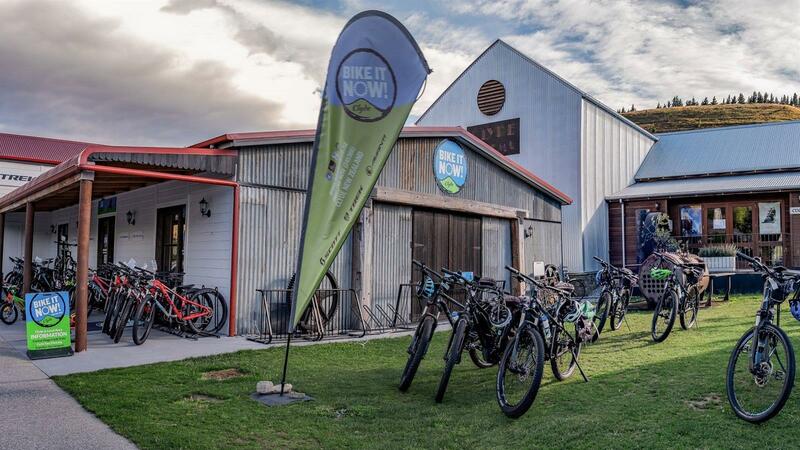 Like most Central Otago business, Bike It Now! understands that everything it does makes a difference, when you’re part of a small community. Simple things – like providing free filtered water and being open seven days – take on extra importance. The businesses here and the people operating them – we’re all very much about Clyde and Central Otago. It’s about bringing people here and sharing the area. Clyde is the place to be. There’s great variation and no two shops are the same. When we went into the business, we had the courage of our convictions to have a crack. But, the great beauty of a place like Clyde is the support people have given us. There’s no way we could survive without that. Central Otago’s diversity is most obvious in its landscape. But look more closely and you’ll find an equally rich diversity of people, skills and stories. For Duncan, Lisa and Fletch, their diversity has proved to be the backbone of their business. The three of us can all turn our hands to any part of the business. That’s important. Between us, we’d worked in education, IT, accountancy and retail – but none of us had ever actually owned a business. However, we realised it was something we could do together and that we had a complementary mix of skill sets. That gave us the confidence to buy the business. We must be doing something right as business is a lot busier than we’d ever envisioned.